^ Spoto, Donald. Enchantment: The Life of Audrey Hepburn. New York: Harmony Books. 2006: 204. ISBN 0-307-23758-3. ^ Barry Paris. Audrey Hepburn. Berkley Books. 1996. ^ Shepherd, Richard. Breakfast at Tiffany's – Anniversary Edition/Centennial Edition audio commentary (DVD). Paramount. 事件发生在 25:20. ^ Erwin, Ellen; Diamond, Jessica Z. The Audrey Hepburn Treasures. New York: Atria Books. October 2006: 107. ISBN 978-0-7432-8986-3. ^ Cinema: Once Over Golightly. Time. October 20, 1961 [2010-10-03]. ^ Corliss, Richard. Audrey Hepburn: Still the Fairest Lady. Time. January 20, 2007 [2010-10-03]. ^ Weiler, A.H. 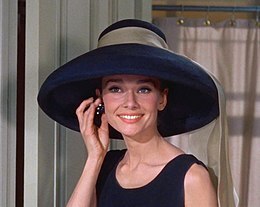 The Screen: Breakfast at Tiffany's: Audrey Hepburn Stars in Music Hall Comedy. The New York Times. October 6, 1961 [2010-10-03]. ^ Auction frenzy over Hepburn dress. BBC NEWS. 2006-12-05. ^ The Most Famous Dresses Ever. Glamour.com. April 2007 [16 May 2011]. ^ Audrey Hepburn dress. Hello Magazine. 6 December 2006. ^ Audrey Hepburn's little black dress tops fashion list. The Independent. 17 May 2010 [16 May 2011]. ^ Steele, Valerie. The Berg Companion to Fashion. Berg Publishers. 9 November 2010: 483 [16 May 2011]. ISBN 978-1-84788-592-0. ^ Shepherd, Richard. Breakfast at Tiffany's – Anniversary Edition/Centennial Edition audio commentary (DVD). Paramount. 事件发生在 3:43. ^ 22.0 22.1 Magagnini, Stephen. Mickey Rooney upset about claims his 'Tiffany's' role is racist. Sacramento Bee. Scripps Howard News Service. September 28, 2008 [2010-10-03]. （原始内容存档于2008年12月5日）. ^ NY Times: Breakfast at Tiffany's. NY Times. [2008-12-24]. ^ Empire: Features. Empireonline.com. [2009-05-16]. ^ Show Archives. The Muny. [2009-05-16]. （原始内容存档于2008-05-28）. ^ Entertainment | West End Breakfast for Anna Friel. BBC News. 2009-05-15 [2009-05-16]. ^ Beakfast At Tiffany's—The Official Broadway Site. [12 April 2013].